Usain Bolt is the most famous sprinter in Olympic history. He won eight gold medals and set numerous world records in doing so. But those medals pale in significance as he recently announced that he had signed to play football with a professional team. For Real or a Gimmick? At this point, we cannot say whether the club signed Bolt as a promotional gimmick or if he actually showed signs of professional talent in football. Growing up in Jamaica, Bolt undoubtedly played a lot of football. But in his professional athletic career, he has been entirely committed to running. So, the jury is still out as to whether he has football skills at age 31 to justify being signed by a professional team for other than marketing purposes. This is far from an athlete of the same age announcing that he is going on walkabout. The questions remain because rather than simply make the official announcement with team officials by his side, Bolt and probably the team as well, decided to whet everyone’s appetite for extraordinary news by announcing the signing and telling us that he will reveal the team on Tuesday. This increases the feeling that it might all be nothing more than a publicity stunt. Bolt long spoke about playing football when his track career ended but he is now already 31 years old and has not played competitive football for at least a full decade. Bolt has stated that his biggest dream in football is to play for Manchester United. He has also said that he would play for other teams if they felt he was good enough to compete in their leagues. He has also offered himself to the Miami club in the North American top league. That club is run by David Beckham but Beckham is not saying whether he thinks that Bolt has the skill to play even in the weak North American league. It is a common misconception that runners are not top tier athletes; that all they do is run. The truth is that stamina, strength, and balance are as important to runners as they are to football players. In addition, the ability to get into a zone mentally despite the size and noise of the crowd is no different for sprinter or striker. No one denies that when Bolt was younger he might have been able to forge a career in professional football. There are many lower football leagues around the world and even if Bolt couldn’t play in the very highest leagues, he might have been successful playing in a lower league. But Usain Bolt never wanted to play football in a lower league. Not when he was enjoying explosive success in his track career. We cannot count even to one the number of athletes who has transitioned from one sport where they excelled to football at age 31. 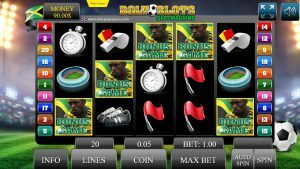 While we’re all waiting for Bolt to make his public statement regarding which team he’s signing with, click below to play our EXCLUSIVE Bolt Slot game. Try your luck at our free slots game complete with free spins and bonus rounds! PLAY OUR EXCLUSIVE BOLT SLOTS GAME HERE! There is a different type of football that has taken Olympic sprinters and turned them into successful players. In the 1980’s the Chicago Bears of the National Football League, meaning the top league that plays American football, signed Olympic sprinter Willie Gault. Gault had success as a receiver in that league but he was a liability in every way other than in running fast and catching throws. Bolt’s frame is too slight for the awesome violence of North American football but is perfect for the international game of football. The talk of him becoming a professional in any team sport was realistic only as it applied to our brand of football. But he is still 31 years old. Bolt fancies himself a striker but no one has as yet seen him make the moves a striker must be able to make with seeming effortlessness. Bolt also probably sees himself as a starter but the teams that have been mentioned as possibilities are so well-established that it is difficult to imagine Bolt becoming a starter over an already established player. Would any team sign Bolt to be a late game replacement? In 2017, there were rumors that Bolt had been offered tryouts with no less than 12 football teams but the names of all twelve were never revealed. At the time, it was thought by most that twelve teams had not offered to give him a tryout but that it made for good press. Now, Bolt has announced that he has signed but won’t reveal the name of the club just yet. Usain Bolt has been an electrifying sprinter covering three Olympic Games. Although it is common for Olympic athletes to win a gold medal without setting a world’s record in the event, Bolt often won gold and set a new world record in the Olympic Games. So, every sports fan much hope that Bolt has indeed been given a chance to succeed in grand style with a big name professional football club. We would be sorely disappointed were all this hoopla prove to be just a publicity stunt. Rather, we hope that Bolt succeeds beyond anyone’s wildest imagination.